Sound wave enables the sensation of hearing, and is an important way of communicating in the animal world. In physics, sound is considered as a mechanical vibration that can propagate in gases, liquids and solids. A research team from the Singapore University of Technology and Design (SUTD), led by Assistant Professor Dr Ye Ai, is studying the interactions between ultrasound (beyond the audible limit of human hearing) and micron-sized objects (e.g. biological cells) suspended in aqueous solutions. Dr Ai's research team recently developed a highly accurate single cell level sorting technology using a highly focused sound wave beam (50 μm wide roughly ¼ of a single human hair's diameter). This new cell manipulation technology enables highly accurate isolation of rare cell populations in complex biological samples. More concisely, it provides the potential of finding a single cell in a million. Single cell analysis, for example the ability to examine DNA mutations at single cell level, is essential for assessing the genetic heterogeneity of cancers among different patients, and thus holds great potential of advancing towards precision medicine for cancer treatment. The key to implementing single cell analysis is the ability to isolate single cells from highly heterogeneous biological samples. According to a recent market analysis conducted by Markets and Markets Research Pte Ltd, the global market size of cell sorting is USD 3.57 billion in 2016 and is expected to reach USD 7.89 billion by 2021 with a compound annual growth rate (CAGR) of 17.2%. Asia is expected to be the fastest-growing market in the next five years owing to increasing government investments in biotechnology and the healthcare sector. Currently, sorting and isolation of rare cell populations is typically performed using fluorescence-activated cell sorting (FACS) system, a technology developed nearly 60 years ago. However, current FACS systems are complex, bulky, and expensive, requiring highly trained personnel for operation, and may produce bio-hazardous aerosols in open environments. Microfluidics technology capable of precise cell manipulation has great potential to reinvent the next-generation cell sorting technology. In this research, Dr Ai's team designed and built an acoustic sorting system that included a disposable microfluidic channel, a reusable sound wave generator and a fluorescence detection module. Target cells with fluorescent labels specific to their surface biomarkers can be recognized by the fluorescence detection module. Upon the detection of a single target cell, the system activates the sound wave generator to produce a pulsed highly focused sound wave beam that can rapidly deflect the target cell to the collection outlet. 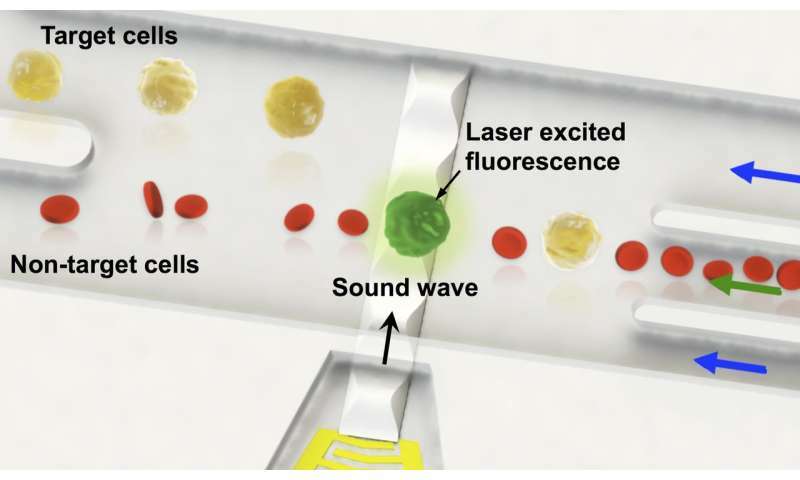 The sound wave beam with a width of 50 μm is highly localized, enabling accurate sorting at the single cell level. Principal investigator, Dr Ai said: "Compared to conventional FACS systems, the merits of this cell sorting technology includes a substantially simplified sorting mechanism that shrinks the instrument size, reduces its complexity and substantially lessens costs. Not only that, but it also enables more accurate single cell level sorting and leaves no damage on target cells because sound waves are much gentler than electric fields widely used in conventional FACS systems." This new cell sorting technology has been published in Lab on a Chip, a top-tier journal focused on research in innovative devices and applications at the micro- and nanoscale. Two SUTD graduate students (Zhichao Ma and Yinning Zhou) and a postdoctoral researcher (David Collins) participated in this project. Dr Ai's team has developed and demonstrated a fully functional laboratory prototype system, and is currently seeking grants to commercialize this technology as a benchtop instrumentation that has a wide application in biological research, clinical diagnosis and cell-based therapeutics.